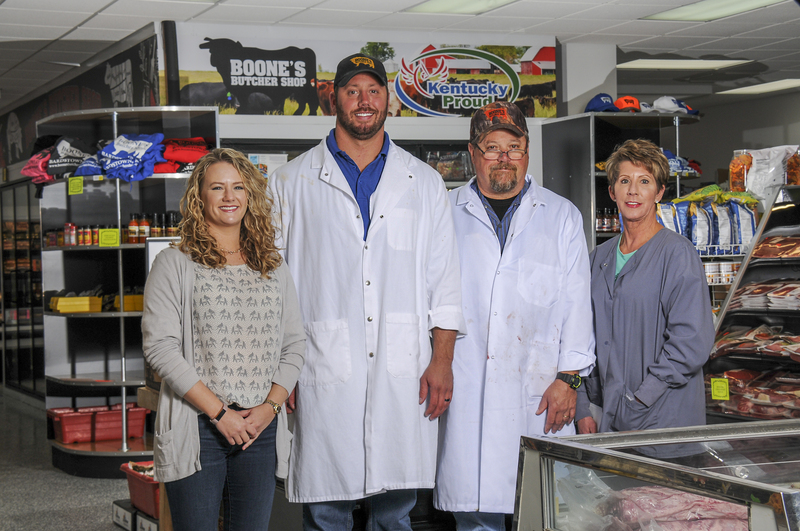 Boone’s Butcher Shop is a family-owned and operated retail meat store, slaughterhouse and custom processing facility. Celebrating over 70 years in business, Boone’s started as a one-room operation in 1946. Luel Boone got started in the business almost by accident – he slaughtered a couple of hogs on his property for a local farmer and sent them to the local locker plant in town. He’d stumbled on a niche waiting to be filled. After a while, the farmers started asking Luel to process their meat and his services were in high demand. The one-room operation soon became two rooms, and two rooms became three rooms, until he’d built a hodgepodge building of over a dozen additions. Luel’s family was a great source for helping hands. His 6 daughters and son, Jerry, all worked in the business from the time they could push a broom. Jerry became a full-time butcher after graduating high school and took over the business from his father in 1979. He and his wife, Donna, and their two children, Allison and Matthew, manage the daily operations of the business to this day. In April of 2004, most of Boone’s Butcher Shop was destroyed in a fire. Jerry and his family decided to rebuild the business. Over a year after the blaze destroyed the building, a new, modern facility opened in the same location. Boone’s mascot, the bull on the top of the building, survived the fire and returned to his rightful place on the new building. Today, Boone’s Butcher Shop boasts over 3,000 square feet of retail space, full of fresh meats, cheeses, deli products, frozen foods and more. We cut and package our fresh meat here in our facility every day. We stock our store with freshly ground beef every morning and have a variety of homemade sausages available. If you’re looking for the perfect cut for your smoker, a couple of high quality steaks for dinner or want to stock your freezer, Boone’s Butcher Shop can help!